Description: Totoro is a forest spirit that little Mei, and later her older sister Satsuki, encounter in a giant camphor tree near their new home in the countryside. Although their father, a university professor, is with them when they move, their mother is in the hospital, recovering from some unnamed illness. When Mei hears that her mother's condition may be getting worse, she resolves to visit her all by herself. When everyone realizes she's missing, only Totoro knows how to find her! 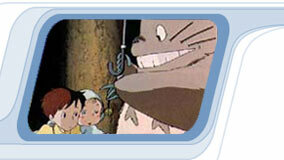 My Neighbor Totoro is my favorite anime of all times. I'm always amazed at how Miyazaki can think of such fantastical stories and portray them so well in animation. This story is cute, sweet, funny, touching and has the sense of innocence that is often lost nowadays. It is also very well animated (needless to say, since it's a Miyazaki anime). Like all Miyazaki animations, My Neighbor Totoro also makes you think of bigger issues like our environment and nature. After watching this, you would want to be with nature more (hopefully). At one point, this anime gave me the idea of just going into the forest, look into the trees and see if there are any Totoros or something like that. (I don't think I have any psychological problems?) One last thing I have to say about this anime: the music is fantastic. Listen to the music trailer and you'll see. The music has a peaceful and happy mood to it. It's great! The word for Totoro is "charm". This is a thoroughly charming movie, rewarding for all ages. It charms like a child's laughter, like the laughter of the two main characters, ten-year-old Satsuki and four-year-old Mei, as they play in and around their new country home. The movie introduces them to Totoro and other supernatural neighbors that only their child's eyes can see, inhuman, unspeaking, and inscrutable, but benign and as playful as themselves. The images are unforgettable: Huge, furry Totoro, jumping to shake raindrops off tree branches, because he likes the sound they make on his borrowed umbrella. Totoro, flying through the air at high speed, roaring with exultation, while the two girls clinging to him roar as well. And who can forget the CatBus, the huge many-legged cat with a passenger compartment, bounding through the woods and along the top of telephone wires? Like all the films Hayao Miyazaki has directed films for Studio Ghibli, this one has gorgeous art, here depicting the Japanese countryside of the 1950's. The use of subtle shades of color, the animation, the music (by Jo Hisaishi), and the production values are all top-notch.